Who is your favourite recipe book author? Hugh? Rick? Jamie? Nigella? I have trouble answering that question, but one that certainly comes close is Mary Berry. I love Mary Berry. I am a complete GBBO addict (of course!). But I was even more addicted to her two recent series: Mary Berry’s Absolute Favourites and Mary Berry’s Foolproof Recipes. Partly because Mary Berry is just so lovely – I love watching her cook – but mostly because her recipes are exactly what I try to achieve with my recipes: easy, straightforward, reasonably quick, family friendly, relatively healthy and not too many (difficult to find) ingredients – in short they are the sort of recipes you will do again and again because they work, they fit into real people’s real lives and they are darn tasty to boot! Do I need to introduce Mary Berry? Not really, I expect. There can’t be many people who haven’t heard of her in the UK, at least (not sure about the rest of the world – do let me know if you are one of my lovely overseas readers 🙂 ). But even as I write that, it occurs to me I don’t know very much about her background. A quick jaunt over to Wikipedia tells me her love of cookery began when she studied domestic science at school, she then went on to study catering at Bath College of Domestic Science. Her first job was for an Electricity Board showroom, showing customers how to use their new electric ovens. Later she went on to study at Le Cordon Bleu school in France. In 1966 she became Food Editor of Housewife Magazine and then later Food Editor for Ideal Home Magazine. Mary has written over 70 recipe books (I know, 70! ), but of course she is best known and loved for being a judge on The Great British Bake Off. I think one of the reasons I like her so much is that she’s not a chef. She’s has obviously done a lot of her cooking at home, not in fancy restaurants and knows what works in real life, where you don’t have lots of equipment / kitchen assistants / time etc. She is also clearly very conscious that not everyone watching her programmes is a trained chef either and ensures her recipes are easy to follow and doable in a normal home. is a book about Mary Berry’s favourite recipes: the ones she likes to cook at home for her family and friends. Now that’s a pretty awesome premise for a book, don’t you think? She has collected together well loved recipes that she has been cooking for years, along with newer favourites too. They are not just recipes that she loves herself, but ones her family (including her young grandchildren) enjoy eating too. In short they are all tried and tested crowd-pleasers. 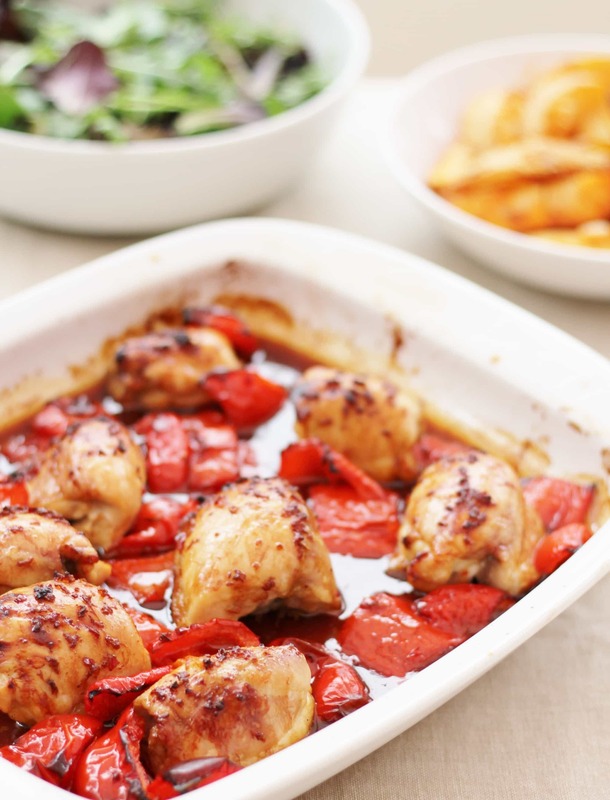 Mary is a big fan of cooking all-in-one dishes (which save on washing up), using the oven as much as possible (because food needs less attention in the oven) and doing recipes you can prepare ahead. 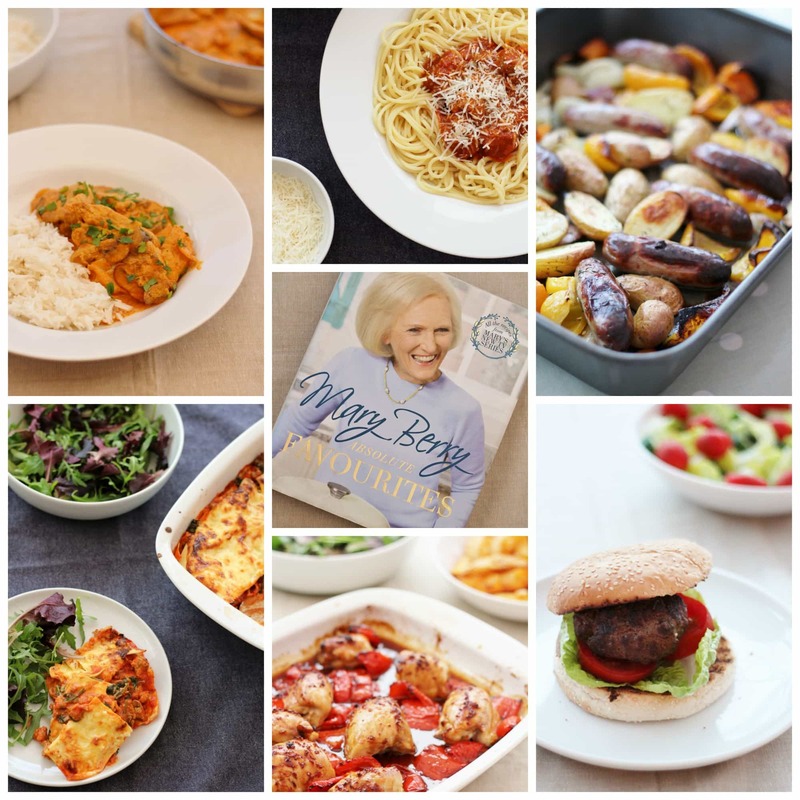 You can see why I love Mary Berry’s recipes so much – this is exactly how I like to cook! She also includes lots of ‘prepare ahead’ tips to ensure cooking is as stress-free as possible. Basically, the whole book is about recipes which are quick, easy and as stress-free as possible – ah music to my ears! 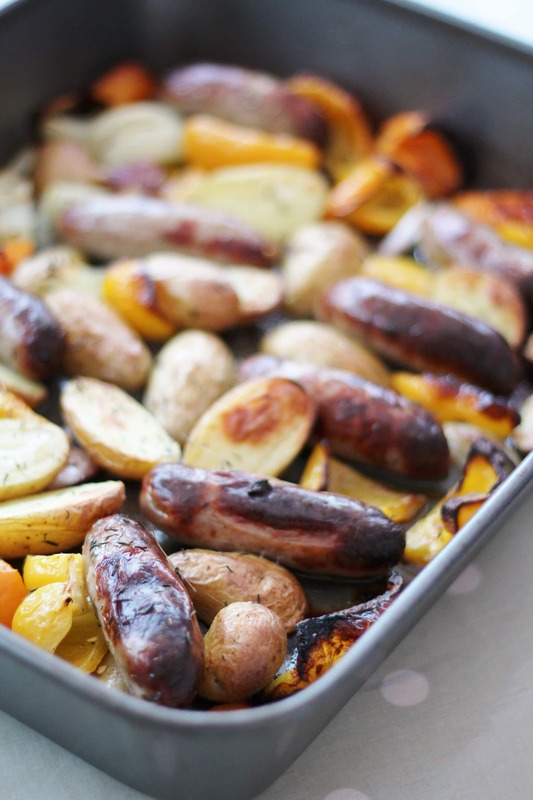 Highlights include: Roasted Sausage and Potato Supper – a super easy traybake I love so much, I make nearly every week! Harissa Spice Lamb and Cannellini Beans – an incredibly tasty one pot Middle Eastern style stew and Saturday Night Pasta – a comforting crowd-pleaser of a pasta bake if ever there was one. is divided up in a fairly standard way: after the introduction comes a chapter of easy Canapés & First Courses. I’m not much of a one for canapés and starters, so I haven’t cooked anything from this section yet, but there are a few I have my eye on which would make lovely lunches, such as her Tomato, Mozzarella and Asparagus Salad. Next comes two meat chapters: one on Pork, Beef & Lamb followed by one on Poultry & Game. I found this quite confusing, as you find a recipe for venison stew in amongst a whole load of chicken ones, but apart from that, this is a fabulous couple of chapters with some great recipes: everything from Chilli Burgers to Meatballs and Sticky Chicken to a full on Roast Turkey Dinner – loads of great recipes, which are all fairly easy and family friendly. Then there’s a pretty comprehensive Fish section, including recipes for Salmon with Tarragon Sauce, Lemon Sole with Fennel Slaw, Prawn and Ginger Noodle Stir-Fry and Smoked Haddock Risotto to mention a few. This is followed by a Vegetables & Salads section, which is full of lovely vegetable side dishes such as Potato Wedges and Asian Slaw. There are only really three proper vegetarian dishes in this section, though – which I found surprising. I expected there to be more. 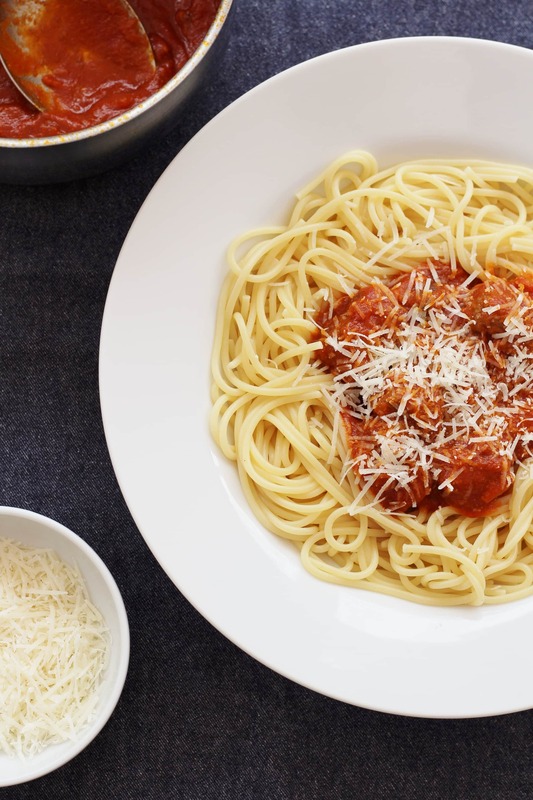 The next section is Pasta & Rice, with some wonderful easy pasta dishes such as Garlic Mushroom Penne Gratin and Seafood Linguine, as well as some delicious sounding rice dishes like Persian Rice and Mary’s version of Paella. There are one or two veggie dishes in this section, but again it’s pretty slim pickings – I’m not sure I’d bother buying this book if I was veggie. Being Mary Berry, there are not one, but two dessert chapters! The first is all about Hot & Cold Puddings. The second is called Tea Time. These chapters are full of the sort of things you’d expect from Mary Berry: Apricot Frangipane Tart, Lemon Meringue Pie, Chocolate Mousse Cake and Lemon Drizzle Cake. Quick tip: have a tissue handy when you read these pages to wipe away the drool! The recipes are clearly laid out. There’s that all important blurb at the top (I think I’ve mentioned before, I hate recipe books that have no introductory blurb to the recipes), there’s a lovely clear and inspiring photograph to guide you as to what the finished result should look like on nearly every page, plus several lovely lifestyle shots – a few of her grandkids and her lovely garden, not to mention her envy-inducing kitchen. The step-by-step recipe instructions are numbered (hoorah!) and there is a clear list of generally easy to find ingredients down the side. My main gripe is there is no guide as to how long the recipes are supposed to take. Grrr! Why? Why? Please can someone tell me why? It drives me mad when I’m meal planning, if I don’t at least have a rough guide as to how long a recipe will take! Actually, in this book there is a real mixture – from quick and easy 30 minute recipes to recipes that take longer to cook in the oven – like the stews and the cakes. In general prep time is short, though there are a few long ones like the Express Lasagne (!) and the Raised Chicken and Ham Pie. The recipes are pretty easy to follow, though I did find a couple of glitches – there’s a recipe in the dessert section for Apricot Frangipane Tart where it forgets to tell you to blind bake the pastry case (then talks in the notes about sprinkling ground almonds on the cooked pastry base – humph) and her Chilli Burger recipe seems a bit short on beef (or the photo is not very accurate) and I was somewhat disgruntled that her Express Lasagne took well over an hour to make (that’s not express in my mind) – but apart from those minor irritations, the rest of the recipes I tried were well explained and easy to do – yey! I have tried loads of recipes from this book. In fact, it’s probably my most used recipe book, currently. It’s just such a great, easy to use book full of stress-free, family friendly recipes. My favourites are definitely her Roasted Sausage and Potato Supper – a super simple sausage traybake – and Harissa Spiced Lamb with Cannellini Beans – a total crowd-pleaser of a one pot shove in the oven and leave type of stew. I haven’t tried a recipe I didn’t like, yet – though the Express Lasagne annoyed me on account of it taking so flippin’ long! A really easy version of a classic. 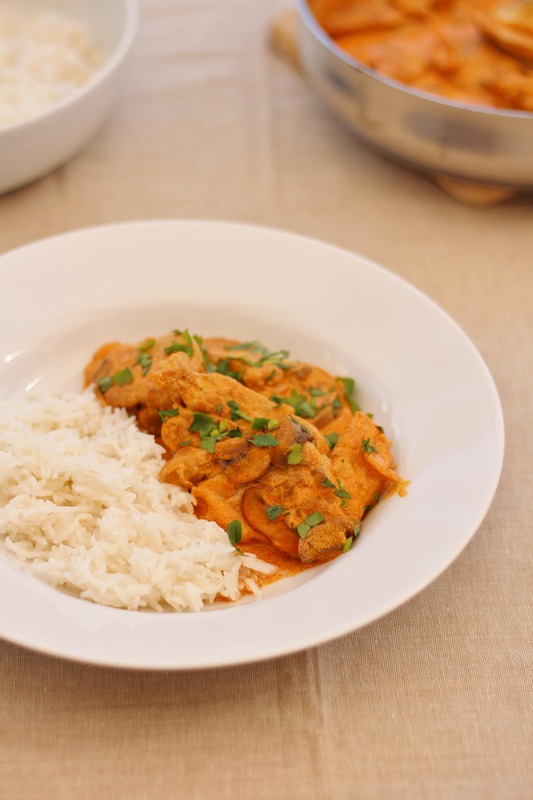 Mary uses sliced pork fillet, which is a great cut of meat for this kind of cooking – really tender and quick to cook – the whole dish was ready in under 30 minutes. Mary flash fries the sliced pork fillet, then removes the pork from the pan before gently frying the onions. She then adds mushrooms and paprika to the pan, followed by the cooked pork, crème fraiche and lemon juice, and serves it with rice and a sprinkling of parsley. Simples! This was ok – probably my least favourite recipe. The meatballs, despite all the things Mary adds to them, were a bit boring. I did like the addition of cayenne pepper to the tomato sauce though, and the kids thought this was fabulous. This was easily their favourite! This was totally delicious, but not at all express. I guess it might be a fraction faster than a lovely slow cooked bolognese sauce turned into a lasagne – but it is still nowhere near ‘express’ in my mind. It took me about 1h30…and I am not an especially slow cook! I loved the flavours in this, though. Mary uses pork sausage meat, which is quicker to cook than beef mince and combines it with chilli, garlic, mushrooms, spinach and crème fraiche to make a sauce. 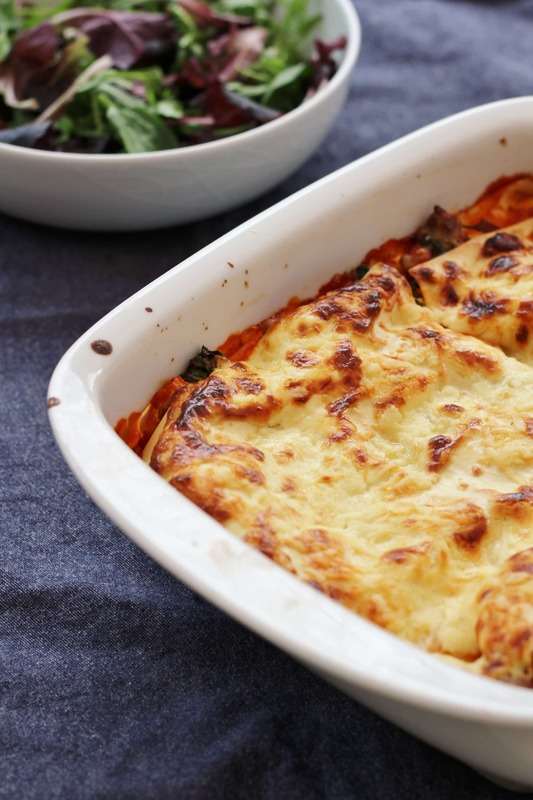 She then layers this with the lasagne sheets and a quick, no-cook tomato sauce. 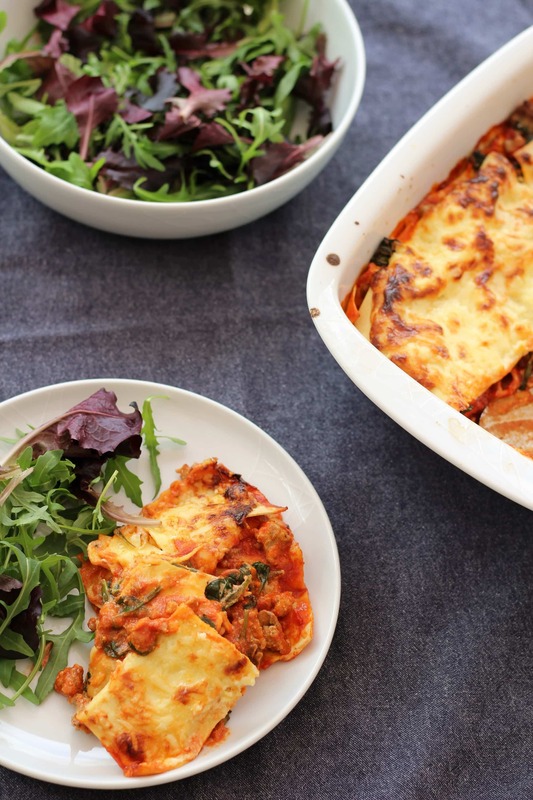 It’s a really great take on lasagne – just save it for a day when you have plenty of time! 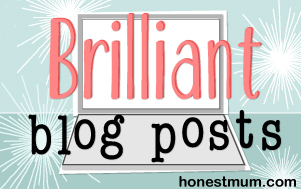 One other note of caution: Mary suggest layering soaking the lasagne sheets in boiling water – I tried this and they all stuck together in one big clump, which I had to chuck in the bin. So I just used the lasagne sheets straight from the packet (as I usually do) and it was fine! This is a totally delicious and very easy way to cook chicken. 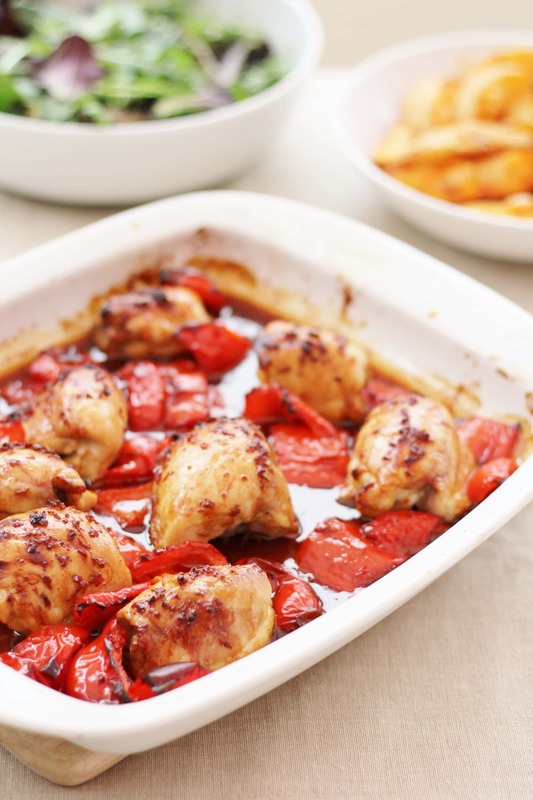 Chicken thighs or breasts are simply coated in a sticky glaze of soy sauce, sesame oil, honey and ginger, and roasted with red peppers for half an hour in a hot oven. 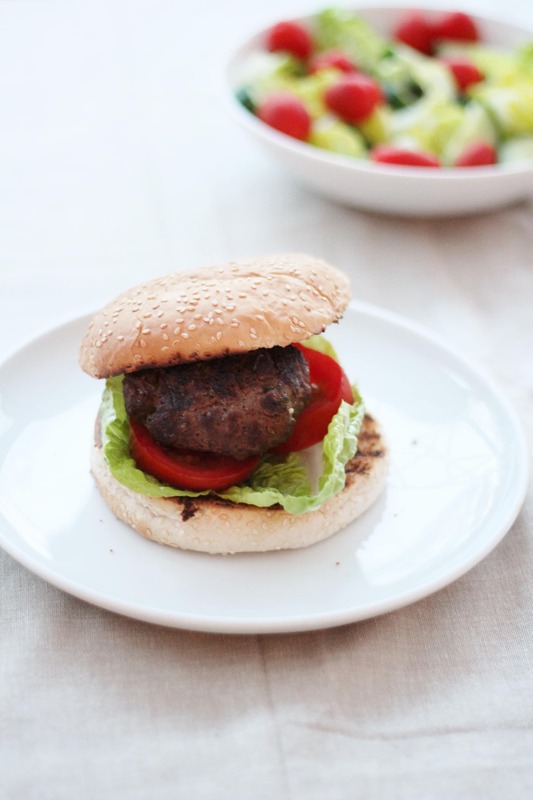 I served these with a green salad and Mary’s paprika-coated Potato Wedges for a simple, but very tasty, midweek supper. I think this is fast becoming a Gargano family favourite! This is a great book for anyone who wants to increase their repertoire of easy peasy, family friendly recipes and doesn’t want to be too adventurous – it’s full of simple recipe and lots of classics. It’s probably not a great book if you are wanting to be particularly adventurous and certainly not that great if you are vegetarian or vegan. But if you love the classics and want a book full of stress-free, family-friendly food and easy-to-make crowd-pleasers then this is the recipe book for you! 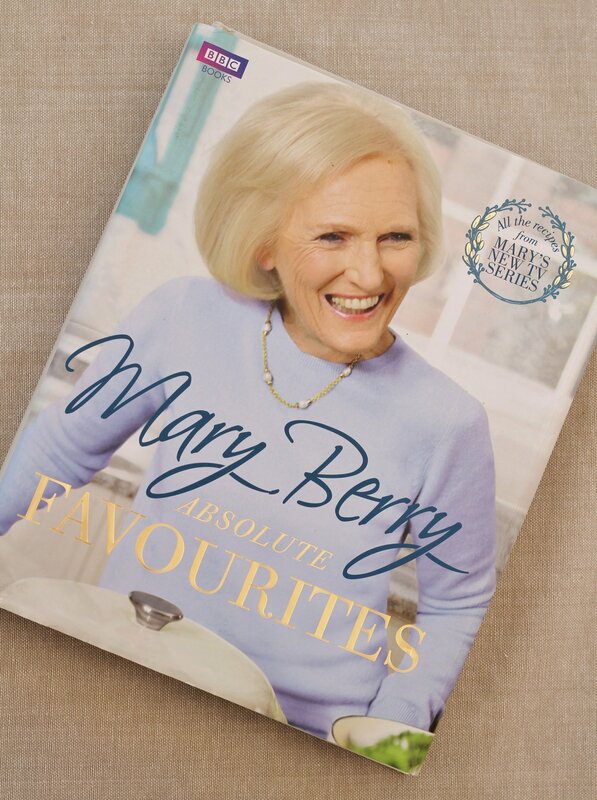 And if you are just a great big fan of Mary Berry, then you’ll really love this book – though if you love Mary that much, you probably already have it! Have you read this book? Do you agree with my review? Are there any other recipe books you would like me to review? I am always open to suggestions! The garlic mushroom penne gratin sounds great (going off the title) but the title of the Express Lasagne is very misleading by the sounds of things….why on earth did they call it express I wonder? !